Set in 1630 during the uneasy peacetime after a civil war rendered many samurai destitute and masterless, Masaki Koboyashi’s haunting drama functions as an allegory condemning militaristic notions of honour. A bedraggled Ronin Hanshiro (Tatsuya Nakadai) appears at the gates of a noted samurai house and asks for the right to commit hara-kiri in their courtyard. The clan chief tries to warn him off by recounting the tale of a young man named Motome Chijiwa (Akira Ishihama) who arrived at their house and attempted what had become a common practice. 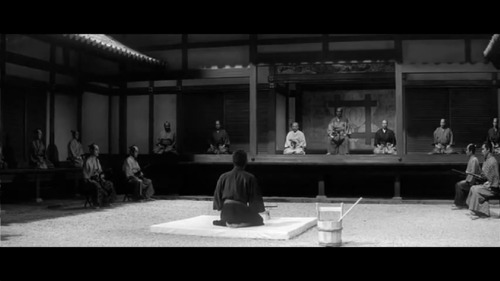 Ronin had taken to appearing at the gates of house of repute and asking to commit suicide. Instead they would be given money and food and sent on their way. Motome is made an example of and forced into carrying out hara-kiri with the bamboo blade he carries instead of a real weapon. This sorry tale does not dissuade Hanshiro who seems resolute and determined to die. Yet he has his own story to tell and a very good reason for visiting this particular house. Koboyashi is best known for the ghostly portmanteau film Kwaidan (1964) and he brings a similar eeriness to HaraKiri. Characters are framed against the background in such a way that they seem impermanent, fragile, just passing through. Miike Takashi’s faithful remake HaraKiri: Death of a Samurai (2011) is out next Friday and though it is almost redundant if you have seen the Koboyashi film it does have a remarkably choreographed final confrontation and is well worth a look.